View of an iron forge on the River Mawddach between Dolgelli and Barmouth in North Wales. The river has its source to the north of the Rhobell Fawr Mountain and it flows through North West Wales until its long estuary to the sea at Barmouth. 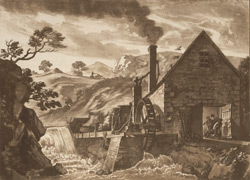 Iron forges like the one depicted in this print needed iron ore, limestone for lining the furnaces, rivers to power the machinery as well as easily accessible large quantities of charcoal or coal.